Cazuela de mariscos or seafood casserole in English, is an excellent Colombian fish soup. 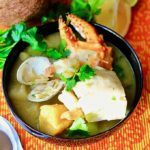 What is the origin of cazuela de mariscos? 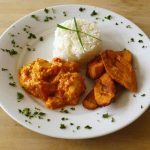 It is a specialty of the beautiful Caribbean coast of Colombia, although this dish is very likely of Spanish origin. It comes from the north-east of the country, in Catalonia, where fresh seafood is abundant and popular. 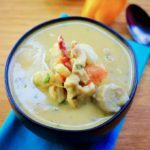 How to make cazuela de mariscos? 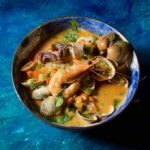 You can add everything you find in there, shellfish, crustaceans such as mussels, shrimps, scampi, clams, cockles, solens, scallops and a very perfumed broth for cooking. The Spaniards add white wine of course but also almond powder, which makes this dish so unique and provides some consistency to the soup. 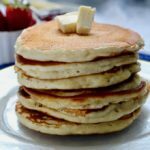 In Colombia, this thickness is obtained with a product that much appreciated by the population, coconut milk, which brings sweetness to the dish and makes it more appealing for kids or those who are typically not fans of shellfish. 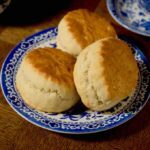 A large pan is usually brought to the center of the table where everyone will pick their serving. 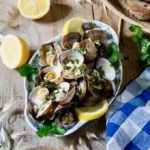 Shellfish is a high-protein, low-fat food. Plus, it is delicious by itself. That said, tasting shellfish in soup or court-bouillon is probably one of the best options. It is no a coincidence that every country in the world has its own recipe for a seafood soup. 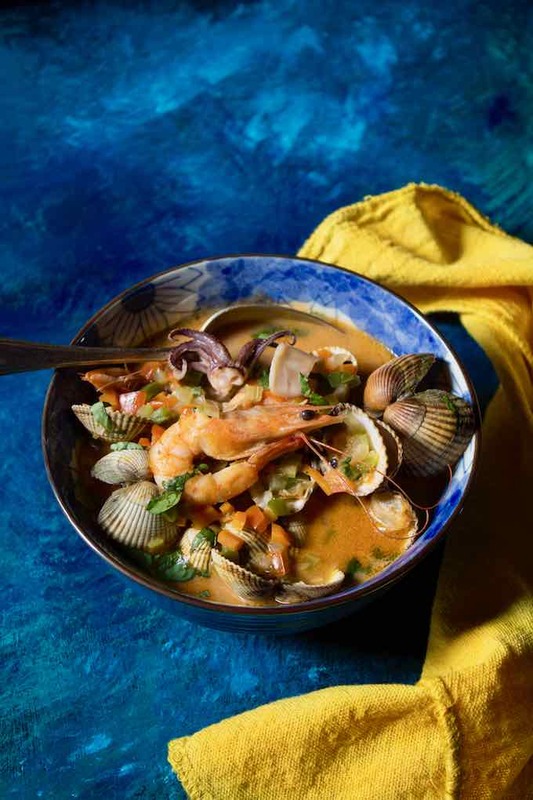 In Colombia, cazuela de mariscos is often prepared for special occasions. People mostly use shellfish or sometimes add fish to enrich it. 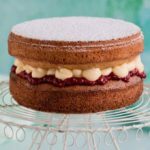 As for all these recipes, the ideal is to go to the market early and enjoy the best deals. 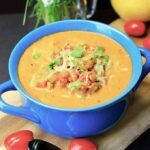 This soup is so popular that it can be found both on the seaside and in the heart of the land, even if the beach holidays are always an opportunity to enjoy a large quantity of this seafood soup. Imagine the Caribbean seaside, a paradise on earth to enjoy delicious seafood in the shade of a coconut tree. In big cities like Bogotá, there are also pre-cooked or raw and frozen seafood mixes. Everyone keeps a bag in the freezer to prepare a small seafood casserole from time to time. Most Colombian restaurants offer this dish on their menu and the cazuela de mariscos is highly appreciated by tourists for its great variety of seafood and its delicious coconut taste which complements them very well. 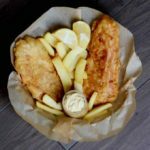 We personally prefer fresh seafood even though they are sometimes hard to find in smaller cities. Seafood tends to lose its iodized taste with freezing. To avoid this, the ingredients must be of the highest quality, as there is nothing worse than seafood that is not so fresh. 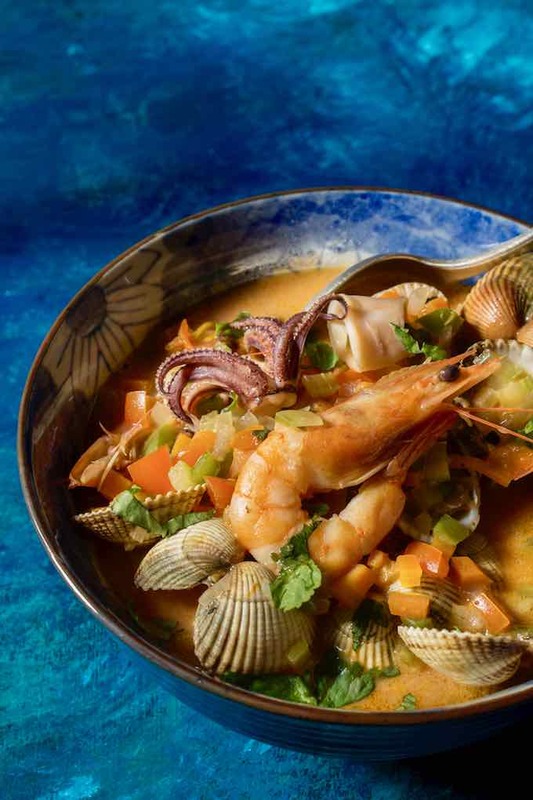 You can find this recipe outside of Colombia under the name of mariscada, sopa siete mares or sopa de mariscos. The ingredients may vary but you will probably find a combination of lobsters, crabs or oysters depending on the region. Vegetables are not always present but they bring a lot of taste and color to the dish. 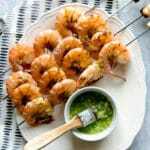 Colombia is lucky to be between the Pacific Ocean and the Caribbean Sea and the same variety of seafood may have a different flavor depending on the ocean in which it is picked up. 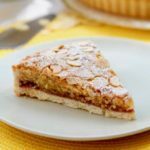 These variations make the Colombian version a true delight. 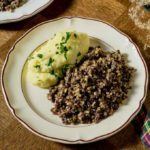 Quick to prepare, it is a generous and convivial recipe that is ideal for a feast with your friends and family. We loved finishing the delicious, extremely tasty and fragrant broth with a good crispy baguette, our own French twist! 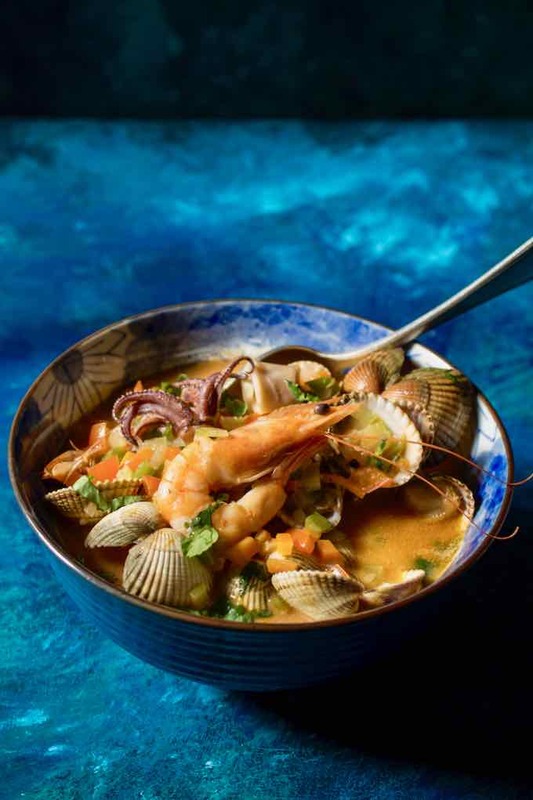 If you are fans of seafood and are looking for something more original, this cazuela de mariscos is made for you! Cazuela de mariscos (seafood casserole) is a delicious traditional dish of the Caribbean region of Colombia that is prepared with seafood, fish and vegetables. Soak the clams in fresh water for 20 minutes. This will get rid of the salt water and sand they contain. Remove them from the water but do not put them in a colander as the sand contained at the bottom of the container could fall on clean clams. Then, use a brush to scrape the shells to remove the last traces of sands and marine residues that would have remained attached. Clean the squid. Remove the thin brown film covering them. Empty them and remove the transparent cartilage. Cut the beak in the head and rinse well. Slice and pat dry with paper towels. In a large pot, heat the olive oil and butter over medium heat. Add the scallion, garlic, red pepper, green pepper, celery and carrots and sauté until tender and translucent (about 10 minutes), stirring regularly. Season with salt and pepper. Add the cream, water, cubes of fish broth, coconut milk, and sprig of thym, then bring to a boil. Add all the seafood and cover. Cook for about 2 minutes over medium heat until the clams are open. Add the tomato paste and the wine, and mix well. Simmer for 15 minutes over low-medium heat. Garnish with cilantro and parsley and serve hot.